Do you or someone you know suffer from low back pain? More than 50% of the general population will face chronic low back pain that lasts more than 12 weeks at some point in their lives. Once you’ve had one incident, the chances of having another one are very high. In this post I explore an important aspect of healthy posture that often decreases or eliminates low back pain in the long run. The star muscle I’ll focus on is the transverse abdominus. The transversus abdominus is a deep spinal support muscle. Its function is to protect and stabilize the joints of the spine so that other muscles can safely move the trunk without compromising the integrity of the spinal joints. The contraction of the transversus, specifically the section below the belly button, increases the stability of the lumbar spinal segments, allowing for safe flexion, extension, and rotation of the spine. Extended periods of sitting will generally cause weakness in the lower fibers of the transversus abdominus because it is not being used. The transversus must be strong enough to do its job of securing the spine, and it also must activate before the outer muscles begin to move the spine. As Certified Rolfer Aline Newton writes, studies have found that a contraction of the transversus precedes arm and leg movements by 110 milliseconds. Newton explains, “A healthy body automatically uses the transversus to stabilize the spine before initiating any movement of the limbs themselves.” However, in patients who experience back pain, the transversus contraction takes longer—from 50-450 milliseconds longer. In other words, a weak transverse abdominus translates to delayed spinal support, and a higher risk of injury. Carolyn Richardson and her colleagues have performed many experiments studying the spinal stabilization musculature involved in reducing low back pain. In one experiment they found that only 10% of people with a history of low back pain could actually activate their transversus abdominus on command. Of those who did not have a history of low back pain, 82% could activate this muscle. Furthermore, the group who followed an exercise program that targeted the transversus over a period of ten weeks experienced a much greater drop in pain and increase in functional stability than the group that followed traditional exercises such as sit-ups, weights, and swimming. After 30 months a follow-up test and evaluation was performed showing the improvements had been sustained. The following exercises should be performed when your back is not in pain. 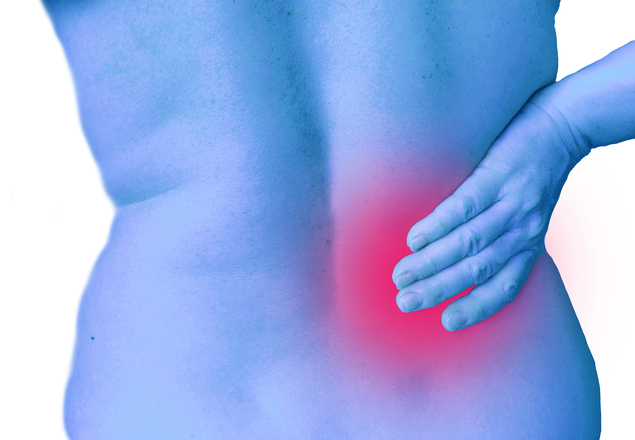 If you are in acute pain, receiving manual therapy to release the tension in the low back is the first step. These exercises are designed to help prevent future pain. If you are experiencing low-level pain, I recommend setting up an appointment with a structural integration massage therapist. Heart Spring Health is an excellent Portland resource for several forms of massage, including structural integration. 1. Hollowing out the Belly. This first transversus abdominus strengthening exercise should not be performed if you have stomach ulcers, hernia, high blood pressure or heart disease. It can be helpful for constipation or indigestion. To do this exercise, stand either in a regular stance or with your knees bent, hands on knees and spine curved forward. Exhale all your breath out strongly through your nose. Powerfully draw your belly button back towards the spine, hollowing the entire abdomen. Hold for 5-15 seconds. Notice when you do this whether your pelvic floor is also engaged. The pelvic floor musculature is best used for bigger demands like picking up something heavy, and shouldn’t be activated every time that the transversus contracts. Differentiating these two areas is fairly simple; it just requires practice with tightening one and keeping the other soft. Mindful awareness of your body sensations will bring about a richer, more enjoyable physical experience. 2. Reverse Curl Ups. First, lie down on your back. Next, lift your feet off the floor, crossing your ankles. Lift the sacrum off the ground. The sacrum is the flat bone at your low back, located just above the tailbone. To lift it, you will need to use your lower abdominals. Lower the sacrum back down and repeat 15 times. Besides strength training, the other important factor in spinal mobilization is to keep the vertebrae moving freely. I will cover this in a later entry. If you have chronic, not acute, low back pain, I suggest these exercises combined with Rolfing Structural Integration, a hands-on body work approach for healing chronic pain and evolving one’s body structure and function. Rolfing does much more than heal chronic pain, but this is a great place for many of us to start, by resolving the physical discomforts of daily life. Adam Persinger has been practicing Rolfing Structural Integration, meditation, and yoga for over ten years. He offers Rolfing Structural Integration at Heart Spring Health. Read more about him at https://heartspringhealth.com and www.holographicbody.com. To schedule an appointment with Adam, contact Heart Spring Health at (503) 956-9396. This entry was posted in Massage Therapy, Structural Integration and tagged massage therapist Portland, structural integration massage, structural integration massage portland.